Lollipop Cottage01263 715779work01603 870304fax Self-cateringThis idyllic stable conversion has been maintained and furnished to a great standard with beautiful oak floors. Featuring spacious rooms, modern utilities, comfortable furniture and situated on an arable farm, the area surrounding this property sports picturesque farmland with horse paddocks. Additionally there are a number of paths to walk and cycle routes nearby. • Heating: Night storage heaters, Convector heater in bathroom, Heating charge applicable for Oct - Apr £15.00 per week, payable on booking. Lollipop Cottage offers weekly bookings starting on Saturday. Lollipop Cottag offers weekly bookings starting on Saturday. 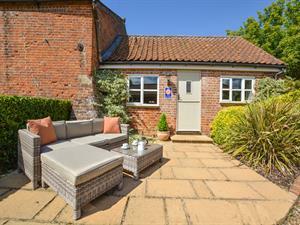 This idyllic stable conversion has been maintained and furnished to a great standard with beautiful oak floors. Featuring spacious rooms, modern utilities, comfortable furniture and situated on an arable farm, the area surrounding this property sports picturesque farmland with horse paddocks. Additionally there are a number of paths to walk and cycle routes nearby.